CLICK MILLIONAIRES IS THE #1 GUIDE TO BUILDING YOUR OWN INTERNET LIFESTYLE BUSINESS. I wrote it to help YOU get finally get YOUR share of the Internet Business Revolution that is happening all around you. Click Millionaires is your award-winning guide to career liberation, financial independence, and the increased satisfaction that comes from finally doing the work you were born to do. Lifestyle Entrepreneurship - The #1 How-To Guide! The American Dream is no longer the “corner office.” It’s a successful business you run from your home office, the beach, or wherever you desire. It’s all about designing the lifestyle you want--one that allows you the freedom and income to live the life you long for. Today the Internet makes it possible for you. In Click Millionaires, Internet millionaire e-commerce expert Scott Fox teaches you how to launch an online lifestyle business—with little or no start-up capital or technical expertise—and trade the 9–5 job you hate for a business you love. 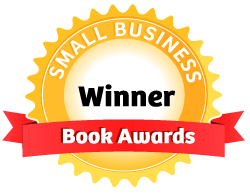 A "Community Choice" Award Winner in the Small Business Book Awards! And many, many more lifestyle entrepreneur success stories whose stories will motivate you to find your own success online. Click Millionaires shows you how to upgrade your life and Your career. This lifestyle business guide uses simple language to explain how to combine automated online marketing, expert positioning, and outsourcing to build a lucrative Internet business, all while working less and setting your own hours. From blogs, YouTube, and online communities to downloadable information products, affiliate marketing, and even freelancing, the book makes it easy to choose an online business model and get started. Learn how to do the work you were born to do instead of working a job you don’t enjoy just to pay your bills. Click Millionaires reveals how you can stop dreaming of a better life…and start living it! Special Reader Bonuses are here for purchasers! If you've read Click Millionaires (or any of Scott's other books), you can get free Special Reports, discounts, and more. Reviews for Click Millionaires are great! "Click Millionaires is a great guide for entrepreneurs to the exciting ‘lifestyle business’ opportunities of the new Internet economy. It will help you profit from the Internet business revolution!" - Marc Ostrofsky, bestselling Author of Get Rich Click! "Today is the Age of the Entrepreneur. It's time to take back responsibility for your income and your future. 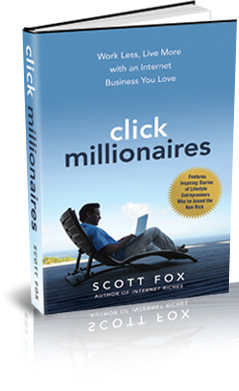 Scott Fox's Click Millionaires offers you a guide book on how you, too, can build a business… and a life you love." - Brian Tracy, Author of Earn What You’re Really Worth and Full Engagement! Visit your local bookstore or order your new copy of Click Millionaires today at Amazon.com or BN.com. The book will be shipped to you right away! - Plus, a great FREE TRIAL of the Click Millionaires "MasterMinds" Coaching Forum! Just enter your email address now to join us for free! Thanks for visiting. FYI - I never recommend things unless I first believe in their quality. However, many of the recommendations and graphics on this site and in related materials are compensated "affiliate" links and other forms of sponsored placements. We also may have received free or discounted products or services in exchange for our reviews or promotions. Your support of these advertisers helps support our free programs and charities.